A Perfect Circle share new song “So Long, And Thanks For All The Fish” here as the release date for Eat The Elephant (April 20, BMG) nears. The song premiered last night on BBC Radio 1’s Rock Show as Daniel P. Carter’s Rockest Record and is available now to stream or download. A Perfect Circle made their Coachella debut last night, playing several new songs including the aforementioned “So Long, And Thanks For All The Fish,” “Eat The Elephant” and “TalkTalk.” In contrast to the festival set, the band plays an intimate outing at Santa Barbara’s Arlington Theatre tomorrow night before returning to the desert for a second performance. On the eve of Eat The Elephant’s release (Thursday, April 19 at 7:15 pm pacific), Maynard James Keenan and Billy Howerdel, in partnership with Revolver, will answer fan’s questions in a rare Q&A (tune in via the band’s Facebook page – facebook.com/aperfectcircle). A Perfect Circle play “Jimmy Kimmel Live!” on Monday, April 23. 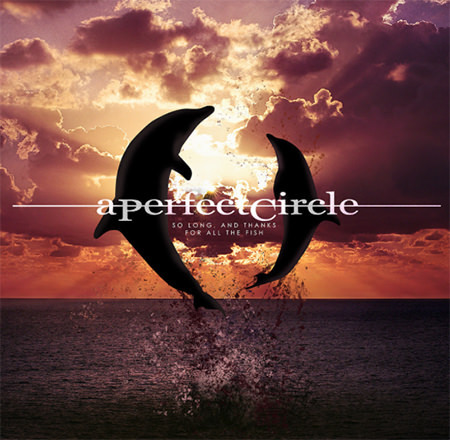 Eat The Elephant pre-orders, which offer instant downloads of “So Long, And Thanks For All The Fish,” “TalkTalk” (https://AperfectCircle.lnk.to/TalkTalkVEVO), “Disillusioned” (https://AperfectCircle.lnk.to/DisillusionedVideoPR) and “The Doomed” (http://smarturl.it/TheDoomedVideo) are available now: https://AperfectCircle.lnk.to/EatTheElephantPR). The 12-song album is available in multiple formats including digital, CD, double gatefold 180-gram vinyl and a box set with both the vinyl and CD as well as a prism and custom playing card deck. In advance of Record Store Day, a limited-edition independent retail exclusive version of the LP on white 180-gram vinyl with alternate cover will also be available.